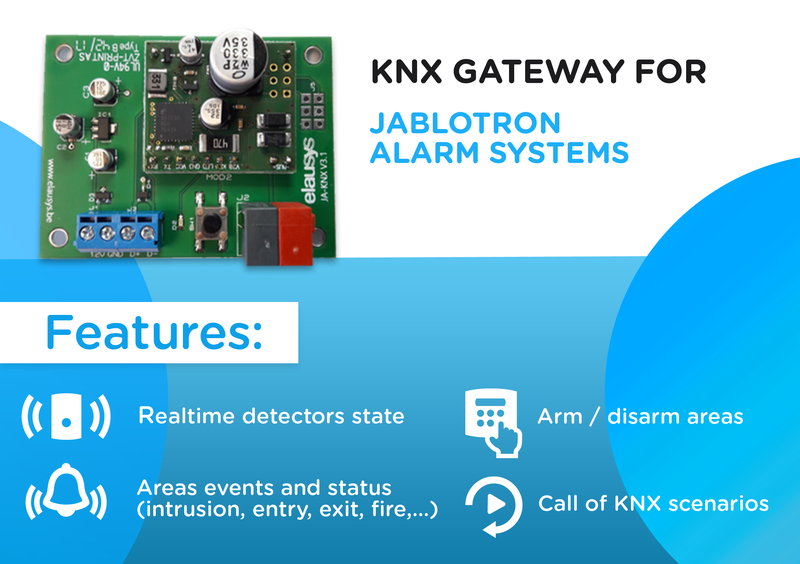 The KNX interface module JA-KNX is a KNX gateway for the Jablotron 100 alarm systems. 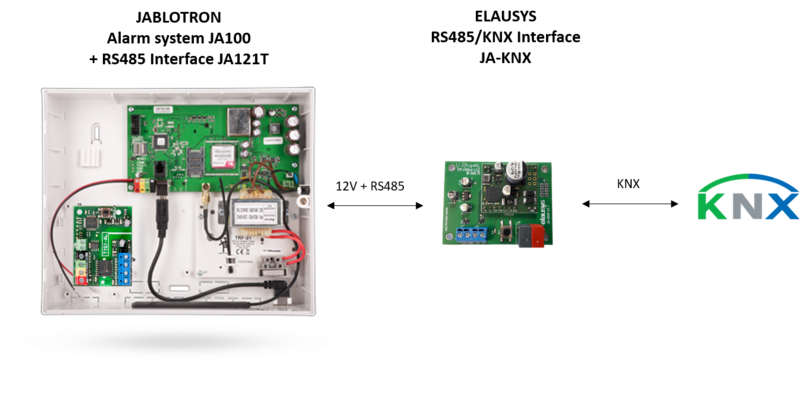 It enables bidirectional communication with the alarm system using the RS485 communication module (JA-121T) from Jablotron. This interface is intended to be used with a JABLOTRON 100 series alarm system. The system must be equipped with a JA121T module for RS485 communication. 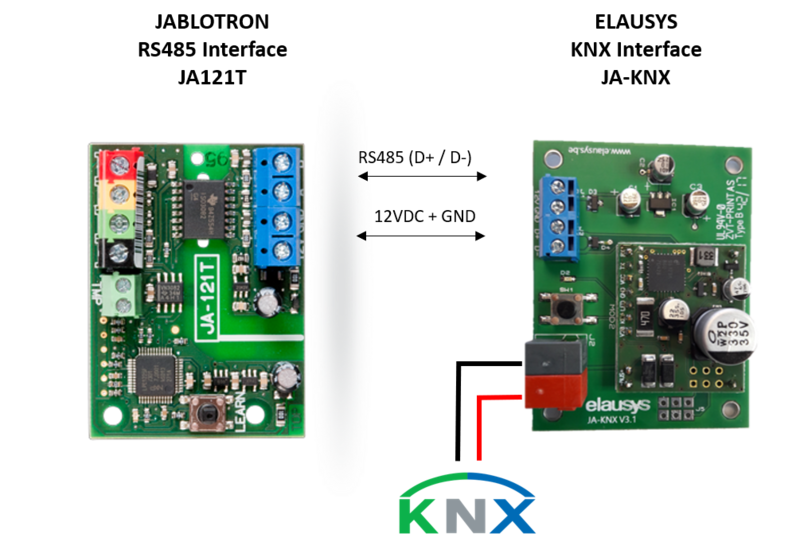 Elausys JA-KNX module is supplied from the KNX bus and provides the 12VDC power supply required by the J121T module. The RS485 bus must be interconnected between the JA121T and the JA-KNX interface using the blue screw terminals on both modules. The termination resistor is already integrated on the KNX interface module, therefore no additional component or wiring is required. Configuration of 16 or 32 PG are available and will be listed in the device group objects. Each PG of the Jablotron alarm system can be controlled by a Group object and its status is retrieved on a separate group object. Each area can be controlled by using the 3 group objects: Arm, arm partially or disarm. Several statuses are available and have a dedicated group object. Up to 4 areas are listed in the group objects. A scene can be assigned to each status. This scene number will be recalled each time the zone status is active (ON). Each area has 12 Group Objects (GO), 3 for control and 9 for the status to KNX.